Is the RBA playing games? I’ve been getting a lot of questions lately about the RBA’s strategy to prick Australia’s ‘property bubble’ and what I think it means. There. Is. No. Property. Bubble. 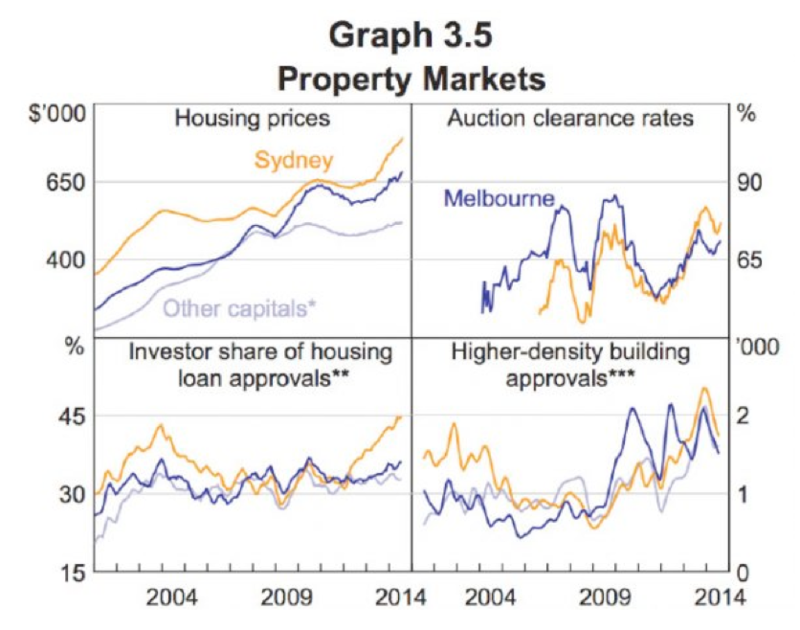 The RBA doesn’t think there’s a property bubble, and they’re not trying to deflate one. It’s become like the abominable snow man. Everyone’s heard of it. No one’s seen it. The truth is a lot more complex and nuanced than that, but hey, bubbles sell. Slap it on the front page and let the every reader fend for themselves. But we have entered interesting and uncharted waters in the past few weeks, so let me lay out what I think is really going on. All the hoo-ha started with the RBA’s semi-annual Financial Stability Review. In that review they devoted a small chapter to the property market. And that’s when they said that there’s a massive property bubble and we’re all going to have to eat dog-food to survive. No. Of course they didn’t. They didn’t mention the term ‘bubble’ once. In recent interviews senior RBA figures have said they don’t even think that property is particularly expensive right now. What they did say though is that they were watching the market closely – particularly competition hotting up between lenders. They noted that the property market had become ‘unbalanced’, and as a result they were discussing “additional steps that might be taken to reinforce sound lending practices”. As they later clarified, they were talking about macro-prudential policies (tweaking banking rules to get the results you want). So to pull it apart, the first thing is the characterisation of the market as ‘unbalanced’. The media lept all over this term (I think because ‘unbalanced’ is a euphemism for crazy), and interpreted it to mean that the RBA thought prices were out of control crazy. But this is almost exactly what the RBA didn’t mean. What the RBA meant is that the property market had become particularly patchy. Prices were booming in some areas, and going nowhere in others. Construction was booming in some regions, and doing nothing in others. Investors were becoming super active in some segments, and not in others. This chart is one of theirs and it tells the story. The bottom right corner shows that there’s a construction boom emerging (as you’d expect following a year of strong price increases). But the point they’re making is that the construction boom is pretty concentrated in higher-density apartments, particularly in Sydney and Melbourne. Building approvals for detached dwellings has seen nothing like this kind of growth. Again, it’s a patchy result. A lot has been made of the bottom left chart. That looks at the share of investors in the market. Apart from Sydney, there’s nothing much to speak of, and the share is hovering around historical averages. But in Sydney, it’s jumped up to almost half of new housing loan approvals – and most importantly to a level not seen since the 2003 boom. What do we make of this? What do we make of the fact that investors account for almost half of new buying? In and of itself, this stat doesn’t phase me too much. In a city like Munich, where 70% of households rent, you’d expect investors to account for about 70% of new buying. And I think in our capitals we’re seeing a bit of an evolution in the property market towards more rentals and investment properties. And I think the great majority of investors aren’t ignorant to what’s happening in the market. In fact, I think the surge in investor buying is just the result of rational investors responding to some pretty clear market signals, and the structural perks that support property as an investment. What probably matters more, is do these investors know what they’re doing? (Always worth asking.) Are they going to be able to cover themselves is the market slows, or even declines? The RBA has actually done a bit of work on this. And they’ve found that most investors in Sydney are higher-income earners, high net-worth individuals, who pockets are deep enough to weather even the most severe storms. Their sense is that property investors are well placed. In this context, a sudden collapse in property prices as over-leveraged investors rush to the exits, seems unlikely. Anyway, I might write more about this later, but the take home I think is that investors are getting active, and owner occupiers, particularly first home buyers, are getting less active… in Sydney. Again, it’s just a very patchy result. The reason that all these patchy outcomes are a headache for the RBA is that interest rates are an incredibly blunt tool. An interest rate cut applies equally to the Melbourne apartment market as it does to detached housing in Wagga. And I think the truth of it is that the RBA would actually like rates to be even lower – to give the rest of the country a kick along. But investors in Sydney and Melbourne are already jumping all over record low rates, and they don’t want too big a wedge opening up between segments. So what the RBA needs is some tools that can deal with this nuance and complexity – that’s macro-prudential. And so that’s what I think the RBA’s doing. They’re making the case for a new, more n imble policy tool-kit. ‘Bubbles’ just have nothing to do with it.